Soder-Wick®, significantly reduces rework/repair time and minimizes the risk of heat damage to the board. Its geometrically precise weave design allows for maximum capillary action and solder capacity. 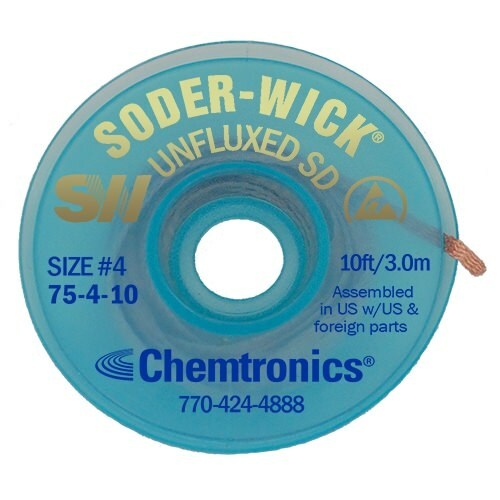 Soder-Wick® Desoldering Braid optimizes heat transfer through the braid and into the solder joint, resulting in faster wicking action than any other competitive brand. Minimal flux residue on the board speeds up the cleaning process or eliminates it entirely. 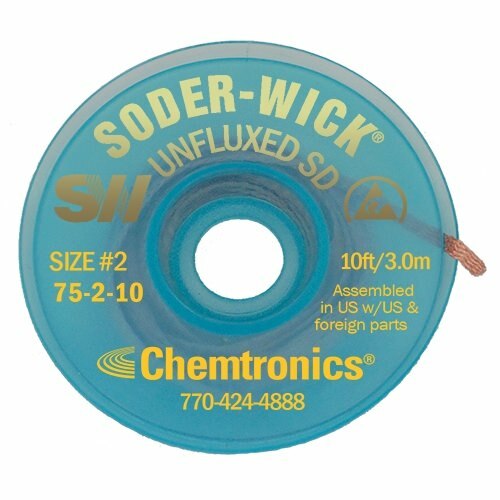 Soder-Wick® Desoldering Braid is available in the most comprehensive variety of widths, lengths, and flux types. Application-specific sizes allow for precision solder removal in a flash. All wick is sealed in nitrogen-purged packaging to avoid corrosion and loss of performance from moisture and oxygen.